October 28, 2005–ECCW: Gurv Sihra participated in a Battle Royal..
November 5, 2005–ECCW: Gurv Sihra was the winner of 10-man Battle Royal..
November 5, 2005–ECCW: Vain & Rage defeated Gurv Sihra & Scott Steel & Kid Xtreme & Adam Antium in Cloverdale..
November 19, 2005–ECCW: Kyle O’Riley & El Phantasmo & Volcano defeated Gurv Sihra & Sid Sylum & Adam Antium.. ????? ?–ECCW: Machete Brown defeated Gurv Sihra..
December 10, 2005–ECCW: Adam Antium defeated Gurv Sihra. January 6, 2006–ECCW: Nelson Creed defeated Gurv Sihra..
January 14, 2006–ECCW: Gurv Sihra defeated Toga Boy..
January 14, 2006–ECCW: El Phantasmo defeated Gurv Sihra..
January 20, 2006–ECCW: S.C.U.M defeated Gurv Sihra & Sid Sylum..
March 17, 2006–ECCW: Sid Sylum defeated Gurv Sihra..
March 17, 2006–ECCW: Gurv Sihra participated in a Battle Royal..
March 18, 2006–ECCW: Aaron Idol & Phantasmo & Volcano beat Sid Sylum & Gurv Sihra & Harv Sihra..
March 25, 2006–ECCW: Junior defeated Gurv Sihra..
March 31, 2006–ECCW: Gurv Sihra & Sid Sylum & Rebecca Knoxx defeated Nikkie Matthews & El Phatasmo & Kyle O’Reilly..
April 2, 2006–ECCW: Vance Nevada & Disco Fury defeated Gurv Sihra & Mikey D..
April 4, 2006–Power Zone Wrestling: Gurv Sihra & Kyle O’Reilly defeated Sid Sylum & Phantasmo..
April 21, 2006–ECCW: Kyle O’Reilly defeated Gurv Sihra..
April 29, 2006–ECCW: Gurv Sihra defeated Ray Brooks..
April 29, 2006–ECCW: El Phantasmo & Halo defeated Gurv Sihra & Harv Sihra & Mike Dempsey..
May 26, 2006–ECCW: Gurv Sihra defeated Mikey D. to win the NWA Pacific Northwest Junior title..
May 27, 2006–ECCW: Scotty Mac & Dk Roc defeated Gurv Sihra & Harv Sihra..
June 1, 2006–High Impact Wrestling: Gurv Sihra vs Jeff Tyler ended in a draw..
June 2, 2006–High Impact Wrestling: Gurv Sihra defeated Bucky McGraw..
June 3, 2006–Ring Masters Entertainment: Gurv Sihra defeated Justin Tyme..
June 4, 2006–RME: Daemon Marx & Johnny Patterson & Jumpin’ Joe beat Gurv Sihra & Cannonball Kelly & Bradley Scott..
July 15, 2006–ECCW: Gurv Sihra won a Battle Royal.. Vance Nevada defeated Gurv Sihra..
July 28, 2006–ECCW: Gurv Sihra & Mike Freeman defeated El Phantasmo & Cutter..
July 29, 2006–ECCW: Gurv Sihra defeated Mikey D..
August 6, 2006–Pure Wrestling Association: Elian Habanero defeated Gurv Sihra..
August 19, 2006–ECCW: Gurv Sihra defeated Major Hardway..
August 25, 2006–ECCW: Sid Sylum & Gurv Sihra & Harv Sihra defeated Halo & Kyle O’Reilly & Volcano..
September 8, 2006–Stampede Wrestling: Ravenous Randy defeated Gurv Sihra and ????? in a 3-WAY Elimination match..
September 23, 2006–ECCW: Gurv Sihra defeated Kyle O’Reilly..
September 29, 2006–ECCW: Harv Sihra & Mikey D. defeated Gurv Sihra & Volcano..
September 30, 2006–ECCW: Gurv Sihra defeated El Phantasmo..
October 20, 2006–ECCW: Gurv Sihra defeated Harv Sihra..
October 27, 2006–ECCW: Seth Knight defeated Gurv Sihra..
November 4, 2006–ECCW: Randy Tyler defeated Gurv Sihra..
November 25, 2006–ECCW: Gurv Sihra defeated Harv Sihra..
December 2, 2006–ECCW: MR2 defeated Gurv Sihra and Harv Sihra in a 3-way match..
December 29, 2007 – ECCW: Aaron Idol & Gurv Sihra defeated Azeem The Dream & Cole Bishop. January 26, 2007–ECCW: Harv Sihra defeated Gurv Sihra to win the NWA Pacific Northwest Junior title..
March 3, 2007–NWA ECCW: Aaron Idol beat Gurv Sirah and Sid Sylum and Kyle O’Riley and Nelson Creed in a Gauntlet..
February 16, 2007 – Tony Condello’s Northern Death Tour: Scotty Mac & Vance Nevada defeated Gurv Sihra & Harv Sihra..
February 17, 2007 – Tony Condello’s Northern Death Tour: The Cremator & Frenchy Lemonte defeatd Gurv Sihra & Harv Sihra..
February 20, 2007 – Tony Condello’s Northern Death Tour: Gurv Sihra defeated Barry Goode.. Gurv Sihra won a Battle Royal..
February 22, 2007 – Tony Condello’s Northern Death Tour: Gurv Sihra & Aurora defeated Vance Nevada & Barry Goode..
February 26, 2007 – Tony Condello’s Northern Death Tour: Aurora defeated Gurv Sihra..
February 27, 2007 – Tony Condello’s Northern Death Tour: The Cremator defeated Gurv Sihra..
February 28, 2007 – Tony Condello’s Northern Death Tour: Gurv Sihra defeated Barry Goode..
March 3, 2007–ECCW: Aaron Idol defeated Gurv Sihra..
March 30, 2007–NWA ECCW: Disco Fury & Mikey D. defeated Gurv Sirah & Harv Sirah..
April 27, 2007–NWA ECCW: The Bollywood Lions (Gurv Sirah & Harv Sirah) defeated Disco Fury & Volcano..
May 4, 2007–NWA ECCW: The Bollywood Lions (Gurv Sirah & Harv Sirah) defeated Mikey DaSheezits & Volcano..
July 14, 2007–NWA ECCW: Cole Bishop defeated Gurv Sirah to retain the NWA Canadian Heavyweight Title..
August 24, 2007–All-Star Wrestling: Disco Fury & Michelle Starr defeated Gurv Sirah & Johnny Obsession..
September 14, 2007 – ASW: Disco Fury & Michelle Starr defeated Gurv Sihra & Johnny Obsession. September 30, 2007 – WCCW: Gurv Sihra & Harv Sihra defeated Bryn Watts & T-Bone. Adrian Walls, Chris Wayne, Gurv Sihra & Harv Sihra defeated Bryn Watts, T-Bone, The Mauler & Vance Nevada. October 20, 2007–NWA ECCW: Bollywood Lions (Gurv Sirah & Harv Sirah) defeated Masked Dudes of Doom..
November 16, 2007–NWA ECCW: Models Inc. (Memphis & MR2) defeated The Bollywood Lions (Gurv & Harv Sirah)..
December 1, 2007 – PZW: Bryn Watts & T-Bone defeated Gurv Sihra & Harv Sihra. December 7, 2007–ECCW/ASW: Gurv Sihra & Harv Sihra defeated Memphis Raines & MR2. March 5, 2008 – RCW: Gurv Sihra defeated Alex Gallagher. June 11, 2008 – PZW: Gurv Sihra & Harv Sihra defeated Kevin Martel & Pete Powers. June 27, 2008 – ECCW: The Bollywood Lions (Gurv Sihra & Harv Sihra) defeats SuperFunk (Fast Freddy Funk & Volcano) by DQ. Funk & Volcano retains. July 5, 2008 – ECCW: The Bollywood Lions (Gurv Sihra & Harv Sihra) defeated Azeem The Dream & Scotty Mac. July 25, 2008 – ECCW: Chill Town (Dropkick Murphy & Sid Sylum) defeated SuperFunk (Fast Freddy Funk & VK) and The Bollywood Lions (Gurv Sihra & Harv Sihra) in a 3-way tag team match to win the tag team titles. July 30, 2008 – PZW: Bryn Watts, Canadian Dream, Deryck Crosse & T-Bone defeated Gurv Sihra, Harv Sihra, Kyle Sebastian & Travis Copeland. August 2, 2008 – ECCW: Azeem The Dream & Billy Suede defeated CJ Strongheart & Gurv Sihra in the 1st round. August 30, 2008 – ECCW: The Bollywood Lions (Gurv Sihra & Harv Sihra) defeated Chill Town (Dropkick Murphy & Sid Sylum) by DQ. Murphy & Sylum retains the titles. September 5, 2008 – WCCW: Gurv Sihra & Harv Sihra defeated Andy Anderson & Vance Nevada. September 6, 2008 – WCCW: Gurv Sihra & Harv Sihra defeated Andy Anderson, Chris Wayne, Heavy Metal, Kyle Sebastian, Slammer, Steven Styles, T-Bone, Teddy Valiant, The Mauler, Vance Nevada in a battle royal. Andy Anderson & Vance Nevada defeated The Bollywood Boyz (Gurv Sihra & Harv Sihra) to win the vacant tag team titles. September 26, 2008 – ECCW: Chill Town (Dropkick Murphy & Sid Sylum) defeated The Sihra Brothers (Gurv Sihra & Harv Sihra) to retain the tag titles. October 17, 2008 – ASW: Gurv Sihra & Harv Sihra defeated Adam Fedyk & Collin Cutler. October 18, 2008 – ASW: Black Dragon defeated Gurv Sihra. October 19, 2008 – ASW: Gurv Sihra & Harv Sihra defeated Disco Fury & Michelle Starr in the semi-finals. Seth Knight & T. Kasaki defeated Adam Fedyk & Collin Cutler and Gurv Sihra & Harv Sihra in a 3-way tag team match to win the tournament and vacant tag team titles. November 1, 2008 – NWA 60th Anniversary Show Tour: Trevor Murdock defeated Gurv Sihra. November 18, 2008 – ASW: Seth Knight & T. Kasaki defeated Gurv Sihra & Harv Sihra. November 28, 2008 – ECCW: The Church Of The Divine Prophecy (Manther & Matt Classic) defeated The Sihra Brothers (Gurv Sihra & Harv Sihra). December 26, 2008 – ECCW: The Church Of The Divine Prophecy (Manther & The Divine Prophet) defeated The Sihra Brothers (Gurv Sihra & Harv Sihra). January 23, 2009 – ASW: Gurv Sihra & Vance Nevada defeated Christopher Ryseck & Skag Rollins. January 24, 2009 – RCW: Gurv Sihra defeated T-Bone. January 30, 2009 – PWA: Eddie Osbourne defeated Gurv Sihra. February 21, 2009 – ASW: Gurv Sihra defeated Marty Sugar. February 27, 2009 – ECCW: Billy Suede & Gurv Sihra defeated The Church Of The Divine Prophecy (Matt Classic & The Divine Prophet). February 28, 2009 – ASW: Gurv Sihra defeated Michelle Starr. March 7, 2009 – ASW: Gurv Sihra defeated Disco Fury in the 1st round. Gurv Sihra defeated Seth Knight in the semi-finals. Gurv Sihra defeated The Great Kasaki to win the King of the Island tournament. March 20, 2009 – ASW: Black Dragon defeated Gurv Sihra. March 21, 2009 – ASW: Gurv Sihra defeated Collin Cutler. March 27, 2009 – RCW: Alexander Hale defeated Gurv Sihra. April 4, 2009 – ECCW: Azeem The Dream defeated Gurv Sihra. April 24, 2009 – ASW: Gurv Sihra & WASP defeated Seth Knight & The Great Kasaki. April 25, 2009 – ASW: Vance Nevada defeated Gurv Sihra in a best 2 out of 3 falls match to retain the ASW Trans-Canada Heavyweight title. May 28, 2009 – MSW: Vance Nevada defeated Gurv Sihra. September 5, 2009 – ECCW: Billy Suede & Kenny Lush defeated The Sihra Brothers (Gurv Sihra & Harv Sihra) in the 1st round. September 12, 2009 – ASW: Gurv Sihra defeated Adrian Walls and I-Ton in a 3-way match. September 18, 2009 – ASW: Christopher Ryseck defeated Gurv Sihra. September 25, 2009 – ECCW: Gurv Sihra defeated Jamie Diaz. October 17, 2009 – ECCW: Austin Spencer defeated Gurv Sihra. October 30, 2009 – ECCW: Azeem The Dream defeated Gurv Sihra to retain the NWA Canadian Junior Heavyweight title. November 27, 2009 – ECCW: Gurv Sihra & Ray Brooks defeated Azeem The Dream & The Divine Prophet. December 4, 2009 – ASW: Gurv Sihra defeated Disco Fury and Vance Nevada in a 3-way match by disqualification. December 18, 2009 – ECCW: Gurv Sihra defeated Azeem The Dream to win the NWA Canadian Junior Heavyweight title. February 19, 2010 – ECCW: Gurv Sihra defeated Azeem The Dream to retain the NWA Canadian Junior Heavyweight title. March 19, 2010 – ECCW: Danni Deeds defeated Gurv Sihra by count-out to retain the NWA Canadian Junior Heavyweight title. April 10, 2010 – ECCW: The Divine Prophet defeated Gurv Sihra. April 23-24, 2010 – MSW: Gurv Sihra defeated Tommy Mack. May 28, 2010 – ECCW: Azeem The Dream defeats Gurv Sihra to win the NWA Canadian Junior Heavyweight title. June 25, 2010 – ECCW: Gurv Sihra defeated Cremator by disqualification. July 24, 2010 – Smash 5: AKIRA defeated Gurvinder Sihra. July 24, 2010 – Smash 6: Gurvinder Sihra defeated Yusuke Kodama. August 27, 2010 – ECCW: The Sihra Brothers (Gurv Sihra & Harv Sihra) defeated Egos And Icons (Jamie Diaz & Nick Price). September 24, 2010 – ECCW: Gurv Sihra defeated Danni Deeds. October 16, 2010 – MSW: Gurv Sihra defeated Tommy Mack. October 29, 2010 – ECCW: The Church Of The Divine Prophecy (Artemis Spencer & The Divine Prophet) defeated Alex Plexis & Billy Suede and The Bollywood Lions (Gurv Sihra & Harv Sihra) in a 3-way tag team match to win the NWA ECCW tag team titles. November 13, 2010 – ECCW: Gurv Sihra defeated El Phantasmo. November 26, 2010 – ECCW: Scotty Mac defeated Gurv Sihra to retain the NWA Canadian heavyweight title. December 9, 2010 – CNWA: The Serial Thrillers (Adam Ryder & Kyle Sebastian) defeated The Bollywood Lions (Gurv Sihra & Harv Sihra). December 26, 2010 – ECCW: El Phantasmo & Kyle O’Reilly defeated The Bollywood Lions (Gurv Sihra & Harv Sihra). January 8, 2011 – ECCW: J-Sin Sullivan defeated Gurv Sihra. January 21, 2011 – ECCW: Billy Suede defeated Gurv Sihra. February 12, 2011 – ECCW: The Bollywood Lions (Gurv Sihra & Harv Sihra) defeated El Phantasmo & Rick The Weapon X.
February 25, 2011 – ECCW: Kenny Lush defeated Gurv Sihra. March 18, 2011 – ECCW: The Bollywood Lions (Gurv Sihra & Harv Sihra) defeated Danni Deeds & The Cremator and El Phantasmo & Rick The Weapon X in a 3-way tag team match to win the tag team titles. April 9, 2011 – ECCW: Billy Suede & Kenny Lush defeated The Bollywood Lions (Gurv Sihra & Harv Sihra) by disqualification. The Bollywood Boyz retains the tag titles. May 7, 2011 – ECCW: Tony Baroni defeated Gurv Sihra to retain the NWA ECCW Canadian heavyweight title. June 18, 2011 – ECCW: The Bollywood Lions (Gurv Sihra & Harv Sihra) defeated J-Sin Sullivan & Tony Baroni to retain the tag titles. June 25, 2011 – ECCW: The Bollywood Lions (Gurv Sihra & Harv Sihra) defeated Chuck Awesomesauce & Jamie Diaz to retain the tag titles. July 9, 2011 – ECCW: The Bollywood Lions (Gurv Sihra & Harv Sihra) defeated Jordie Taylor & Ray Brooks to retain the tag team titles. July 16, 2011 – ECCW: Alex Plexis & J-Sin Sullivan defeated The Bollywood Lions (Gurv Sihra & Harv Sihra). September 10, 2011 – ECCW: The Bollywood Lions (Gurv Sihra & Harv Sihra) defeated Jordie Taylor & Ray Brooks to retain the tag team titles. September 24, 2011 – ECCW: Chuck Awesomesauce, Danni Deeds, Jamie Diaz & Sid Sylum defeated Nick Price & The Bollywood Macs (Scotty Mac & The Bollywood Lions (Gurv Sihra & Harv Sihra)). September 30, 2011 – ECCW: Artemis Spencer defeated Gurv Sihra. October 1, 2011 – ECCW: Alex Plexis, J-Sin Sullivan, Jamie Diaz & Sid Sylum defeated Bishop, Scotty Mac & The Bollywood Lions (Gurv Sihra & Harv Sihra). October 28, 2011 – ECCW: The Bollywood Lions (Gurv Sihra & Harv Sihra) defeated Greatness On Demand (Disco Fury & Michelle Starr) to retain the tag titles. November 26, 2011 – ECCW: Air Pirates (Alex Plexis & Ravenous Randy) defeated The Bollywood Lions (Gurv Sihra & Harv Sihra) to win the tag titles. December 3, 2011 – ECCW: The Bollywood Lions (Gurv Sihra & Harv Sihra) defeated Billy Suede & El Phantasmo. December 9, 2011 – ASW: Greatness On Demand (Disco Fury & Michelle Starr) defeated The Bollywood Lions (Gurv Sihra & Harv Sihra). December 26, 2011 – ECCW: Gurv Sihra & Nicole Matthews defeated KC Spinelli & Ravenous Randy. January 7, 2012 – ECCW: Artemis Spencer defeated Bishop, Gurv Sihra and Ravenous Randy in a 4-way match to retain the NWA Canadian heavyweight title. February 4, 2012 – ECCW: The Riot (Nicole Matthews & Ravenous Randy) defeated The Bollywood Lions (Gurv Sihra & Harv Sihra) to retain the tag titles. February 12, 2012 – Ring Ka King (Taped): The Bollywood Boyz (Gurv Sihra & Harv Sihra) defeated The Mumbai Cats (Leopard & Puma ) in the quarter-finals. February 18, 2012 – Ring Ka King (Taped): RDX (Sir Brutus Magnus & Sonjay Dutt) defeats The Bollywood Boyz (Gurv Sihra & Harv Sihra) in the semi-finals. February 24, 2012 – ECCW: Gurv Sihra vs. Ravenous Randy in the 1st round ended in a double disqualification. February 25, 2012 – ECCW: Moondog Manson & The Riot (Andy The Dreadful Bird, Nicole Matthews & Ravenous Randy) defeated The Administration (Red DeNero & Scotty Mac) & The Bollywood Lions (Gurv Sihra & Harv Sihra) in a tag team elimination match. February 26, 2012 – Ring Ka King (Taped): Raisha Saeed & The Sheiks (Abdul Bashir & Mustafa Bashir) defeated Mickie James & The Bollywood Boyz (Gurv Sihra & Harv Sihra). March 4, 2012 – Ring Ka King (Taped): The Bollywood Boyz (Gurv Sihra & Harv Sihra) defeated Broadway & Hollywood. March 10, 2012 – Ring Ka King (Taped): The Bollywood Boyz (Gurv Sihra & Harv Sihra) & Pagal Parinda defeated Jimmy Rave, Maxx B & Zema Ion. March 24, 2012 – Ring Ka King (Taped): The Sheiks (Abdul Bashir & Mustafa Bashir), Dr. Nicholas Dinsmore & TNT defeated The Bollywood Boyz (Gurv Sihra & Harv Sihra), Barood & Romeo Rapta. April 7, 2012 – Ring Ka King (Taped): The Bollywood Boyz (Gurv Sihra & Harv Sihra) defeated Broadway & Hollywood and Patthani Patthe (Big Patthani Patthani & Junior Patthe) and The Sheiks (Abdul Bashir & Mustafa Bashir) in a 4-way tag team match to become #1 contenders for the tag team titles. April 14, 2012 – Ring Ka King (Taped): The Bollywood Boyz (Gurv Sihra & Harv Sihra) defeated RDX (Abyss & Scott Steiner) to win the tag team titles. April 27, 2012 – ECCW: Sid Sylum defeated Gurv Sihra in the 1st round. May 26, 2012 – ECCW: The Bollywood Boyz (Gurv Sihra & Harv Sihra) defeated Azeem The Dream & Sid Sylum. June 23, 2012 – ECCW: The Bollywood Boyz (Gurv Sihra & Harv Sihra) defeated The Riot (Andy The Dreadful Bird & Nicole Matthews). June 29, 2012 – ECCW: The Bollywood Boyz (Gurv Sihra & Harv Sihra) vs. The Riot (Nicole Matthews & Ravenous Randy) ended in a no contest. July 27, 2012 – ECCW: The Bollywood Boyz (Gurv Sihra & Harv Sihra) defeated The Stallions (Artemis Spencer & Tony Baroni). September 22, 2012 – ECCW: The Bollywood Boyz (Gurv Sihra & Harv Sihra) defeated The Stallions (Artemis Spencer & Tony Baroni) in a best 2 out of 3 falls match. October 6, 2012 – ECCW: The Bollywood Boyz (Gurv Sihra & Harv Sihra) defeated Danni Deeds & Moondog Manson by disqualification. October 13, 2012 – ECCW: The Bollywood Boyz (Gurv Sihra & Harv Sihra) defeated The Riot (Alex Plexis & Andy The Dreadful Bird). October 27, 2012 – ECCW: The Stallions (Artemis Spencer & Tony Baroni) defeated Jordie Taylor & Red DeNero and Team Live Badass (Ethan HD & Mike Santiago) and The Bollywood Boyz (Gurv Sihra & Harv Sihra) in a tag team gauntlet match to become #1 contenders for the tag team titles. November 10, 2012 – ECCW: Bishop & The Bollywood Boyz (Gurv Sihra & Harv Sihra) defeats The Grappling Gorilla & The Riot (??? & Andy The Dreadful Bird). December 8, 2012 – ECCW: The Riot (Nicole Matthews & Ravenous Randy) defeated The Administration (Jamie Diaz & Scotty Mac) and The Bollywood Boyz (Gurv Sihra & Harv Sihra) in a 3-way tag team match to retain the titles. December 15, 2012 – ECCW: The Riot (Alex Plexis & Ravenous Randy) defeated The Bollywood Boyz (Gurv Sihra & Harv Sihra) to retain the tag titles. January 12, 2013 – ECCW: The Administration (Jamie Diaz & Scotty Mac) defeated The Bollywood Boyz (Gurv Sihra & Harv Sihra) by disqualification. February 9, 2013 – ECCW: KC Spinelli, The Bollywood Boyz (Gurv Sihra & Harv Sihra) & The Stallions (Artemis Spencer & Tony Baroni) defeated The Administration (Jamie Diaz & Scotty Mac) & The Riot (Alex Plexis, Nicole Matthews & Ravenous Randy) in a 4-way tag team elimination match. March 9, 2013 – ECCW: The Administration (Jamie Diaz & Scotty Mac) defeated Sid Sylum & The King Of The Yukon and The Administration (Jordie Taylor & Red DeNero) and The Bollywood Boyz (Gurv Sihra & Harv Sihra) and The Riot (Alex Plexis & Ravenous Randy) in a tag team gauntlet to win the tag titles. April 27, 2013 – ECCW: Kenny Lush & The Bollywood Boyz (Gurv Sihra & Harv Sihra) defeated Ethan HD, Mike Santiago & Scotty Mac. May 11, 2013 – ECCW: The Bollywood Boyz (Gurv Sihra & Harv Sihra) defeated The Administration (Jamie Diaz & Scotty Mac) in a lumberjack match to win the tag team titles. May 24, 2013 – ECCW: The Bollywood Boyz (Gurv Sihra & Harv Sihra) defeated The Stallions (Artemis Spencer & Tony Baroni) to retain the tag titles. June 8, 2013 – ECCW: The Bollywood Boyz (Gurv Sihra & Harv Sihra) defeated The Administration (Jamie Diaz & Scotty Mac) to retain the tag titles. June 21, 2013 – ECCW: The Bollywood Boyz (Gurv Sihra & Harv Sihra) defeated The American Guns (Ethan HD & Mike Santiago) and The Riot (Andy The Dreadful Bird & Ravenous Randy) in a 3-way tag to retain the tag titles. July 6, 2013 – ECCW: The Bollywood Boyz (Gurv Sihra & Harv Sihra) defeated The Administration (Jamie Diaz & Jordie Taylor) to retain the tag team titles. September 14, 2013 – ECCW: Gurv Sihra defeated J-Sin Sullivan. October 5, 2013 – ECCW: America (?? ?, ?? ?, ?? ?, ??? & J-Sin Sullivan) defeated The Bollywood Boyz (Gurv Sihra & Harv Sihra) & The Riot (Alex Plexis, Andy The Dreadful Bird & Nicole Matthews) in a tag team elimination match. October 12, 2013 – ECCW: The Bollywood Boyz (Gurv Sihra & Harv Sihra) defeated The Wrestlers (Carl Cunningham & Frank Cunningham). November 2, 2013 – ECCW: The Bollywood Boyz (Gurv Sihra & Harv Sihra) defeated The American Guns (Ethan HD & Mike Santiago) in a street fight to win the tag team titles. January 18, 2014 – ECCW: The Amerikan Guns (Ethan HD & Mike Santiago) defeated The Bollywood Boyz (Gurv Sihra & Harv Sihra) and The Riot (Andy The Dreadful Bird & Nicole Matthews) in a 3-way tag team match to win the tag titles. April 18, 2014 – ECCW: The Bollywood Boyz (Gurv Sihra & Harv Sihra) defeated The American Guns (Ethan HD & Mike Santiago) to win the tag team titles. May 2, 2014 – ECCW: The Bollywood Boyz (Gurv Sihra & Harv Sihra) defeated Bishop & Ethan HD to retain the tag team titles. May 3, 2014 – ECCW: The Bollywood Boyz (Gurv Sihra & Harv Sihra) defeated Brady Malibu & MR2 to retain the tag team titles. May 10, 2014 – ECCW: GODS (Bishop & Sid Sylum) vs. The Bollywood Boyz (Gurv Sihra & Harv Sihra) ended in a no contest. May 31, 2014 – ECCW: GODS (Bishop & Sid Sylum) defeated The Bollywood Boyz (Gurv Sihra & Harv Sihra) in a street fight. June 21, 2014 – ECCW: The Bollywood Boyz (Gurv Sihra & Harv Sihra) & The Stallions (Artemis Spencer & Tony Baroni) defeated Ethan HD, Nelson Creed, Pete Powers & Sid Sylum. July 1, 2014 – Tigerfest: The Bollywood Boyz (Gurv Sihra & Harv Sihra) defeated John Greed & Tyson Dux. July 12, 2014 – ECCW: The Bollywood Boyz (Gurv Sihra & Harv Sihra) defeated GODS (Bishop & Sid Sylum) in a street fight. August 23, 2014 – ECCW: DTA (Daniel Adonis & Jordie Taylor) defeated The Bollywood Boyz (Gurv Sihra & Harv Sihra) to win the tag team titles. October 4, 2014 – ECCW: Billy Suede, Chuck Taylor & Gurv Sihra defeated Brady Malibu, Nelson Creed & Pete Powers. October 18, 2014 – ECCW: Nelson Creed defeated Gurv Sihra. November 28, 2014 – ECCW: ECCW champion Bishop defeated Gurv Sihra by disqualification to retain the title. December 8, 2014 – ECCW: ECCW champion Bishop defeated Gurv Sihra to retain the title. January 17, 2015 – ECCW: Gurv Sihra was in a barroom rumble won by Mike Santiago. February 7, 2015 – ECCW: Gurv Sihra, Kenny Lush & The King Of The Yukon defeated Nelson Creed, Randy Tyler & The Ladies Choice. February 28, 2015 – ECCW: Gurv Sihra vs. Nelson Creed ended in a double count-out. March 21, 2015 – ECCW: The Cunninghams (Jack Cunningham & Karl Cunningham) defeated The Bollywood Boyz (Gurv Sihra & Harv Sihra) by disqualification to retain the tag team titles. April 9, 2015 – ECCW/BWW: Cougar Meat (Collin Cutler & Kyle Sebastian) defeated DTA (Daniel Adonis & Jordie Taylor) and The Bollywood Boyz (Gurv Sihra & Harv Sihra) in a 3-way tag team elimination match. April 10, 2015 – ECCW/BWW: The Bollywood Boyz (Gurv Sihra & Harv Sihra) & Jeff Jarrett defeated Cougar Meat (Collin Cutler & Kyle Sebastian) & Billy Suede. April 11, 2015 – ECCW: The Bollywood Boyz (Gurv Sihra & Harv Sihra) defeated Jeff Jarrett & Nelson Creed. May 23, 2015 – ECCW: The Bollywood Boyz (Gurv Sihra & Harv Sihra) defeated The Entourage (Brady Malibu & MR2). June 13, 2015 – ECCW: The BBC (Randy Tyler & The Ladies Choice) vs. The Bollywood Boyz (Gurv Sihra & Harv Sihra) ended in a no contest. July 4, 2015 – ECCW: The Bollywood Boyz (Gurv Sihra & Harv Sihra) defeated The Entourage (Brady Malibu & Pete Powers). July 11, 2015 – ECCW: The Bollywood Boyz (Gurv Sihra & Harv Sihra) defeated The BBC (Ladies Choice & Randy Tyler) and The Cunninghams (Jack Cunningham & Karl Cunningham) in a 3-way tag to win the tag team titles. July 24, 2015 – GFW TV Tapings: The Bollywood Boyz (Gurv Sihra & Harv Sihra) defeated The Akbars (Ali Akbar & Omar Akbar) in the 1st round. August 7, 2015 – ECCW: The Bollywood Boyz (Gurv Sihra & Harv Sihra) defeated Hellion & Nick Price to retain the tag team titles. August 8, 2015 – ECCW: The Bollywood Boyz (Gurv Sihra & Harv Sihra) defeated Next Gen (Justin Alexander & Nick Radford) to retain the tag titles. August 15, 2015 – ECCW: The American Guns (Ethan HD & Mike Santiago) defeated The Bollywood Boyz (Gurv Sihra & Harv Sihra) by disqualification. The Bollywood Boyz retains the tag team titles. September 19, 2015 – ECCW: The Bollywood Boyz (Gurv Sihra & Harv Sihra) defeated The Cunninghams (Jack Cunningham & Karl Cunningham) and Alex Plexis & Ethan HD in a 3-way tag team ladder match to retain the tag titles. October 17, 2015 – ECCW: The Bollywood Boyz (Gurv Sihra & Harv Sihra) defeated The Voros Twins (Chris Voros & Patrick Voros) to retain the tag titles. October 23, 2015 – GFW TV Tapings: The Bollywood Boyz (Gurv Sihra & Harv Sihra) defeated The Whirlwind Gentlemen (Jack Manley & Remy Marcel) in the semi-finals. The Bollywood Boyz (Gurv Sihra & Harv Sihra) defeated Reno SCUM (Adam Thornstowe & Luster The Legend) to win the tournament and vacant tag team titles. December 5, 2015 – ECCW: Nicole Matthews & The Bollywood Boyz (Gurv Sihra & Harv Sihra) defeated Cat Power & The West Coast Express (Alex Plexis & Nelson Creed). January 16, 2016 – ECCW: The Bollywood Boyz (Gurv Sihra & Harv Sihra) defeated The West Coast Connection (Alex Plexis & Nelson Creed) to retain the GFW tag team titles. February 13, 2016 – ECCW: The Cunninghams (Jack Cunningham & Karl Cunningham) defeated The Bollywood Boyz (Gurv Sihra & Harv Sihra). February 18, 2016 – RCW: Bobby Sharp, Scott Justice & Slammer defeated Scotty Mac & The Bollywood Boyz (Gurv Sihra & Harv Sihra). February 19, 2016 – RCW: The Bollywood Boyz (Gurv Sihra & Harv Sihra) defeated The Redneck Renegades (Joey Vendetta & Rex Roberts) to win the tag team titles. February 20, 2016 – RCW: The Redneck Renegades (Joey Vendetta & Rex Roberts) defeated The Bollywood Boyz (Gurv Sihra & Harv Sihra) to win the tag team titles. April 9, 2016 – ECCW: El Phantasmo defeated Gurv Sihra to retain the ECCW title. April 23, 2016 – WrestleSport: The Bollywood Boyz (Gurv Sihra & Harv Sihra) defeated The Cunninghams (Jack Cunningham & Karl Cunningham) to retain the GFW tag team titles. May 14, 2016 – ECCW: The Bollywood Boyz (Gurv Sihra & Harv Sihra) defeated King Khash & Xavier Galaxy. May 27, 2016 – ASW: Azeem The Dream & Christopher Ryseck vs. The Bollywood Lions (Gurv Sihra & Harv Sihra) ended in a double count-out to retain the tag team titles. June 4, 2016 – ECCW: The Bollywood Boyz (Gurv Sihra & Harv Sihra) defeated The Cunninghams (Jack Cunningham & Karl Cunningham). June 11, 2016 – ECCW: The Bollywood Boyz (Gurv Sihra & Harv Sihra) defeated Bishop & Scotty Mac. July 16, 2016 – ECCW: The Bollywood Boyz (Gurv Sihra & Harv Sihra) vs. The Cunninghams (Jack Cunningham & Karl Cunningham) ended in a no contest. July 22, 2016 – ASW: Cougar Meat (Collin Cutler and Kyle Sebastian) vs. The Bollywood Boyz (Gurv Sihra and Harv Sihra) in the 1st round ended in a time limit draw. August 3, 2016 – WWE Cruiserweight Classic: Noam Dar defeated Harv Sihra in the 1st round. August 31, 2016 – WWE Cruiserweight Classic: The Bollywood Boyz (Gurv Sihra and Harv Sihra) defeated Ariya Daivari and Sean Maluta in a dark match. September 14, 2016 – WWE Cruiserweight Classic: The Bollywood Boyz (Gurv Sihra and Harv Sihra) defeated Martin Stone and Sean Maluta in a dark match. September 24, 2016 – ECCW: The Cunninghams (Jack Cunningham and Karl Cunningham) defeated The Bollywood Boyz (Gurv Sihra and Harv Sihra). October 5, 2016 – NXT: The Authors Of Pain (Akam and Rezar) defeated The Bollywood Boyz (Gurv Sihra and Harv Sihra) in the 1st round of the Dusty Rhodes tag team classic. November 18, 2016 – NXT Live Event: The Bollywood Boyz (Gurv Sihra and Harv Sihra) defeated Adrian Jaoude and Cezar Bononi. December 2, 2016 – NXT Live Event: Angelo Dawkins and Kenneth Crawford defeated The Bollywood Boyz (Gurv Sihra and Harv Sihra). December 3, 2016 – NXT Live Event: The Bollywood Boyz (Gurv Sihra and Harv Sihra) defeated Angelo Dawkins and Kenneth Crawford. December 9, 2016 – NXT Live Event: Angelo Dawkins and Kenneth Crawford defeated The Bollywood Boyz (Gurv Sihra and Harv Sihra). February 8, 2017 – NXT: SAnitY (Alexander Wolfe and Killian Dain) defeated The Bollywood Boyz (Gurv Sihra and Harv Sihra). March 2, 2017 – NXT Live Event: Heavy Machinery (Otis Dozovic and Tucker Knight) defeated The Bollywood Boyz (Gurv Sihra and Harv Sihra). March 31, 2017 – WrestleMania Axxess: Harv Sihra defeated Mustafa Ali. April 5, 2017 – NXT: Heavy Machinery (Otis Dozovic and Tucker Knight) defeated The Bollywood Boyz (Gurv Sihra and Harv Sihra). April 18, 2017 – SmackDown Live: Jinder Mahal defeated Dolph Ziggler, Erick Rowan, Luke Harper, Mojo Rawley and Sami Zayn in a 6-way match to become #1 contender for the WWE title. The Bollywood Boys helped out Jinder Mahal winning the match. May 1, 2017 – Live Event: Luke Harper and Randy Orton defeated Erick Rowan and Jinder Mahal w Samir Singh & Sunil Singh. April 30, 2017 – Payback: Jinder Mahal w Samir & Sunil Singh helped Bray Wyatt defeat Randy Orton. May 2, 2017 – SmackDown Live: Jinder Mahal w Samir & Sunil Singh defeated Sami Zayn. May 9, 2017 – SmackDown Live: Baron Corbin, Jinder Mahal w The Singh Brothers and Kevin Owens defeated AJ Styles, Randy Orton and Sami Zayn. May 16, 2017 – SmackDown Live: Jinder Mahal w The Singh Brothers defeated AJ Styles. May 21, 2017 – SmackDown Live: Jinder Mahal w The Singh Brothers defeated Randy Orton to win the WWE title. June 6, 2017 – SmackDown Live: WWE champion Jinder Mahal w The Singh Brothers defeated Mojo Rawley in a non-title match. June 18, 2017 – Money In The Bank: Jinder Mahal w The Singh Brothers defeated Randy Orton to retain the WWE title. June 20, 2017 – SmackDown Live: WWE champion Jinder Mahal w The Singh Brothers defeated Luke Harper in a non-title match. August 15, 2017 – SmackDown Live: John Cena defeated WWE champion Jinder Mahal w The Singh Brothers by disqualification in a non-title match. Baron Corbin decides to cash his Money In The Bank. WWE champion Jinder Mahal defeated Baron Corbin to retain the WWE title. 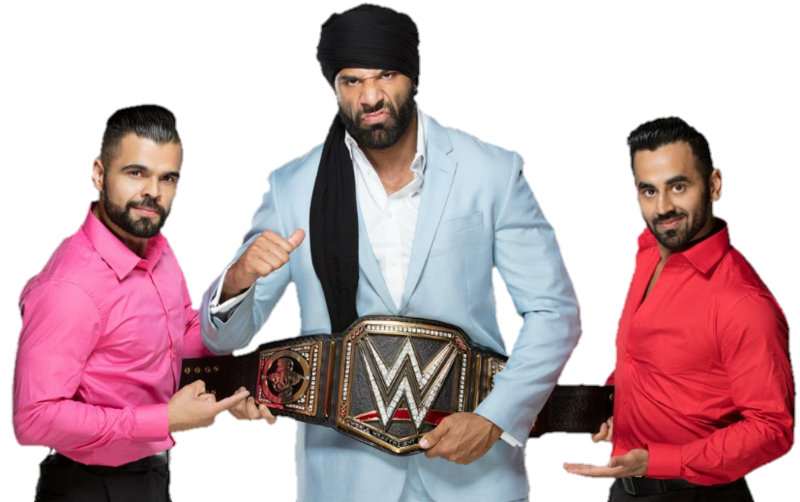 August 20, 2017 – SummerSlam: WWE champion Jinder Mahal w The Singh Brothers defeated Shinsuke Nakamura to retain the WWE title. August 22, 2017 – SmackDown Live: Shinsuke Nakamura defeated The Singh Brothers w Jinder Mahal in a handicap match. October 24, 2017 – SmackDown Live: AJ Styles defeated Sunil Singh w Samir Singh. October 31, 2017 – SmackDown Live: AJ Styles defeated Samir Singh w Sunil Singh. November 28, 2017 – SmackDown Live: WWE champion AJ Styles defeated The Singh Brothers (Samir Singh and Sunil Singh) in a handicap, non-title match. Jinder Mahal turned on the Singh Brothers after the match. December 9, 2017 – Live Event: Triple H defeated Jinder Mahal w The Singh Brothers. December 17, 2017 – Clash Of Champions: AJ Styles defeated Jinder Mahal w The Singh Brothers to retain the WWE title. December 19, 2017 – SmackDown Live: AJ Styles, Randy Orton and Shinsuke Nakamura defeated Jinder Mahal, Kevin Owens and Sami Zayn w The Singh Brothers. January 13, 2018 – Live Event: Randy Orton and Shinsuke Nakamura defeated Jinder Mahal & The Singh Brothers (Samir Singh and Sunil Singh) in a handicap match. January 16, 2018 – SmackDown Live: Jinder Mahal w The Singh Brothers defeated Xavier Woods w The New Day in the semi-finals. Bobby Roode defeated Jinder Mahal w The Singh Brothers to win the tournament and vacant United States title. January 23, 2018 – SmackDown Live: Bobby Roode & The New Day (Kofi Kingston and Xavier Woods) defeated Aiden English, Jinder Mahal w Sunil Singh and Rusev. January 24, 2018: It has been confirmed that Samir Singh went for a ACL surgury and will be out of action for a unknown amount of time. January 28, 2018 – Royal Rumble: Jinder Mahal w Sunil Singh was in the Royal Rumble match won by Shinsuke Nakamura. January 30, 2018 – SmackDown Live: Rusev defeated Jinder Mahal w Sunil Singh, Kofi Kingston and Zack Ryder in a 4-way match to become #1 contender for the United States title. March 6, 2018 – SmackDown Live: Jinder Mahal w Sunil Singh defeated Randy Orton. March 13, 2018 – SmackDown Live: Jinder Mahal w Sunil Singh defeated Bobby Roode. March 27, 2018 – SmackDown Live: Jinder Mahal w Sunil Singh and Rusev defeated Bobby Roode and Randy Orton. April 3, 2018 – SmackDown Live: Rusev w Aiden English defeated Jinder Mahal w Sunil Singh. April 8, 2018 – WrestleMania 34: Jinder Mahal w Sunil Singh defeated Bobby Roode, Randy Orton and Rusev in a 4-way match to win the United States title. April 16, 2018 – RAW: Jinder Mahal was part of the superstars shake up and is now a member of Monday Night RAW. Jeff Hardy defeated Jinder Mahal w Sunil Singh to win the WWE United states title. April 23, 2018 – RAW: Chad Gable defeated Jinder Mahal w Sunil Singh. April 27, 2018 – Greatest Royal Rumble: Jeff Hardy defeated Jinder Mahal w Sunil Singh to retain the WWE United States title. April 30, 2018 – RAW: Bobby Lashley, Braun Strowman and Roman Reigns defeated Jinder Mahal w Sunil Singh, Kevin Owens and Sami Zayn. May 7, 2018 – RAW: Jinder Mahal w Sunil Singh defeated Chad Gable. May 21, 2018 – RAW: Roman Reigns and Seth Rollins defeated Jinder Mahal w Sunil Singh and Kevin Owens. May 28, 2018 – RAW: Jinder Mahal w Sunil Singh defeated Seth Rollins by disqualification. Rollins retains the Intercontinental title. June 4, 2018 – RAW: Elias and Jinder Mahal w Sunil Singh defeated Roman Reigns and Seth Rollins. June 11, 2018 – RAW: Roman Reigns defeated Sunil Singh w Jinder Mahal. June 17, 2018 – Money In The Bank: Roman Reigns defeated Jinder Mahal w Sunil Singh. June 18, 2018 – RAW: Jinder Mahal w Sunil Singh defeated Chad Gable. July 5, 2018 – Main Event: Jinder Mahal w Sunil Singh defeated Zack Ryder. July 30, 2018 – RAW: Jinder Mahal w Sunil Singh defeated Braun Strowman by count-out. August 6, 2018 – RAW: Jinder Mahal w Sunil Singh defeated Braun Strowman by disqualification. August 13, 2018 – RAW: Braun Strowman and Finn Balor defeated Jinder Mahal w Sunil Singh and Kevin Owens. August 27, 2018 – RAW: Dean Ambrose defeated Jinder Mahal w Sunil Singh. September 24, 2018 – RAW: Finn Balor defeated Jinder Mahal w Sunil Singh. September 25, 2018 – Mixed Match Challenge: Bobby Lashley and Mickie James defeated Alicia Fox and Jinder Mahal w Sunil Singh. October 1, 2018 – RAW: Bayley w Finn Balor defeated Alicia Fox w Jinder Mahal & Sunil Singh. October 2, 2018 – Mixed Match Challenge: Bayley and Finn Balor defeated Alicia Fox and Jinder Mahal w Sunil Singh. October 8, 2018 – RAW: Bayley and Finn Balor defeated Alicia Fox and Jinder Mahal w Sunil Singh. October 15, 2018 – RAW: Finn Balor defeated Jinder Mahal w Alicia Fox, Sunil & Samir Singh. Samir Singh made his return. October 26, 2018 – Main Event: Zack Ryder defeated Jinder Mahal w The Singh Brothers. October 29, 2018 – RAW: Elias defeated Jinder Mahal w The Singh Brothers. October 30, 2018 – Mixed Match Challenge: Braun Strowman and Ember Moon defeated Alicia Fox and Jinder Mahal w The Singh Brothers. November 5, 2018 – RAW: Apollo Crews defeated Jinder Mahal w Sunil Singh. November 20, 2018 – Mixed Match Challenge: Alicia Fox and Jinder Mahal w The Singh Brothers defeated Bobby Roode and Natalya. November 26, 2018 – RAW: Ember Moon w Curt Hawkins defeated Alicia Fox w Jinder & The Singh Brothers. Jinder Mahal w The Singh Brothers defeated No Way Jose. November 27, 2018 – Mixed Match Challenge: Alicia Fox and Jinder Mahal w The Singh Brothers defeated Curt Hawkins and Ember Moon. December 3, 2018 – RAW: Finn Balor defeated Jinder Mahal w The Singh Brothers. December 10, 2018 – RAW: Bayley defeated Alicia Fox w Jinder Mahal & The Singh Brothers. December 11, 2018 – Mixed Match Challenge: Alicia Fox and Jinder Mahal w The Singh Brothers defeated Apollo Crews and Bayley in the semi-finals. December 16, 2018 – TLC: Carmella and R-Truth defeated Alicia Fox and Jinder Mahal w The Singh Brothers to win Mixed Match Challenge, they also become #30 in their respective Royal Rumble events, also winning a trip anywhere in the world. December 26-27, 2018 – Live Event: Jinder Mahal was in the #1 contender battle royal for the Intercontinental title won by Apollo Crews. December 31, 2018 – RAW: Jinder Mahal & The Singh Brothers (Samir Singh and Sunil Singh) defeated Heath Slater and Rhyno in a handicap match. January 21, 2019 – RAW: The Lucha House Party (Gran Metalik, Kalisto and Lince Dorado) defeated Jinder Mahal & The Singh Brothers (Samir Singh and Sunil Singh). February 1, 2019 – Main Event: The Lucha House Party (Gran Metalik, Kalisto and Lince Dorado) defeated Jinder Mahal & The Singh Brothers (Samir Singh and Sunil Singh). February 15, 2019 – Main Event: The B-Team (Bo Dallas & Curtis Axel) and Tyler Breeze defeated Jinder Mahal & The Singh Brothers (Samir Singh and Sunil Singh). February 15-16, 2019 – Live Event: The Lucha House Party (Gran Metalik, Kalisto and Lince Dorado) defeated Jinder Mahal & The Singh Brothers (Samir Singh and Sunil Singh). February 22, 2019 – Main Event: The B-Team (Bo Dallas & Curtis Axel) and Tyler Breeze defeated Jinder Mahal & The Singh Brothers (Samir Singh and Sunil Singh). February 23-24, 2019 – Live Event: Heath Slater, Rhyno and Titus O’Neill defeated Jinder Mahal & The Singh Brothers (Samir Singh and Sunil Singh). February 25, 2019 – RAW: Kurt Angle defeated Jinder Mahal w The Singh Brothers. March 8, 2019 – Main Event: The Lucha House Party (Kalisto & Lince Dorado) and Tyler Breeze defeated Jinder Mahal & The Singh Brothers (Samir Singh and Sunil Singh). March 15, 2019 – Main Event: The Lucha House Party (Gran Metalik, Kalisto and Lince Dorado) defeated Jinder Mahal & The Singh Brothers (Samir Singh and Sunil Singh). March 15-17, 2019 – Live Event: The Lucha House Party (Gran Metalik, Kalisto and Lince Dorado) defeated Jinder Mahal & The Singh Brothers (Samir Singh and Sunil Singh). March 18, 2019 – RAW: Ricochet defeated Jinder Mahal w The Singh Brothers. March 25, 2019 – RAW: Finn Balor defeated Bobby Lashley and Jinder Mahal w The Singh Brothers & Lio Rush in a handicap match to become #1 contender for the Intercontinental title. April 1, 2019 – RAW: Apollo Crews defeated Jinder Mahal w The Singh Brothers in a lumberjack match.